3. In triplet numbers 543-432 etc. 3. Multiplication operator in e-shells? 1/7 - a mathematical principle behind the synthesis of fatty acids - and collagen? "Numeral series hidden in the distribution of atomic mass of amino acids to codon domains in the genetic code". but with a pattern returning in sciences of superposed levels too. congruent with common human experience. 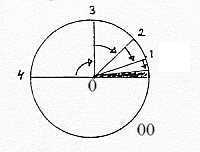 Charge, Electromagnetic waves, Spin etc. A suggested interpretation of Charge as property. All advanced mathematics excluded. Some new, perhaps "odd" and very simple arithmetic introduced for derivation of numbers such as quotients in physics, with the hypothesis that they ultimately originate from number of dimension degrees (see one example below). 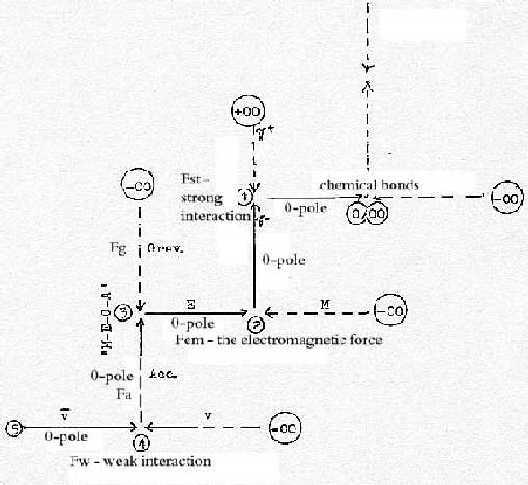 A dimension degree (d-degree) is in this model characterized as the relation between 2 complementary "poles". This principle of complementarity is central (in agreement with treats in quantum mechanics too). The definition of dimensions as the number of "independent" variables is not accepted; everything is assumed interrelated. Polarizations are assumed as the elementary principle of development'. It's assumed as responsible for steps towards lower d-degrees. Science seeks tracing manifoldness back to unity. The creation of universe would presumably have the opposite direction. Hence, this model starts with the "whole", with the "Entirety". and this "Entirety" is assumed as 5-dimensional, of one higher degree than the commonly accepted 4 in established physics. This doesn't exclude developments of more polarities and dimensions - or fractals within each step in accordance with theories of later decades. Starting point - at the border to metaphysics, at the triple point between metaphysics, concepts and geometry, at Big Bang - is regarded as a real point, a Zero, a "0-pole", a centre, in accordance with accepted physical views but perhaps more extreme. Complementary pole becomes the undefined opposite, the "infinity" as a "00-pole" (∞, written 00). This implies a redefining of the problematic "infinity" to the concept of "anticenter". These first definitions make up the first polarization of the 5-dimensional "Entirety" to 0 and 00, centre and anticenter, from which all following complementarities are inherited. The 4-dimensional degree is defined as Direction. Conceptually, that which is created through a point (and its undefined surrounding) is directions outwards-inwards. Geometrically this is vectors, in common definition objects which in addition to positions in 3 dimensions also demand the 4th specification of Direction. Through polarization between outwards and inwards, here the complementary "poles" (or partial structures") of d-degree 4, principally anti-parallel, and with a loss of direction, a 3-dimensional world of volumes for masses and space is created, and roughly speaking with a radial - circular geometry (or with negative - positive curvature) as geometrical poles. In other words: partial structures with enclosed in opposition to excluded centres. The 3rd d-degree when polarized defines in its turn surfaces, 2-dimensional structures with geometries of the type "inside - outside" or "convex - concave",. The polarity can also be thought of as geometrically appearing in sine curves. In this last structural step a polarization of surfaces are assumed to lead to 1-dimensional structures as lines. 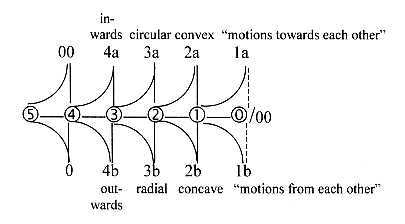 1-dimensional structures are assumed to polarize into Motions: with "motions towards each other" (converging) and "motions from each other", (diverging) as the complementary "poles" in this step. The types of geometrical complementarities in these first "postulates" may be acceptable. In which way simple polarizations create the geometries of the lower degrees out of higher ones is a more serious question. The simple statements above may rise immediate doubts. Yet, the question is left here for later discussions. In this chain of polarizations towards lower degrees each step implies 1 d-degree debranched. Lost degrees in a unit are interpreted as transformed into external motions. There is also the alternative that lost degrees as 1-dimensional structures meet "the other way around" - in synthesizing direction, being built-in into structural element in units of higher degrees. Motions towards each other defines a centre, a zero or 0-pole; motions from each other an anti-center, a 00-pole Still not the same as the poles of the "Entirety" of d-degree 5. This "dimension degree 0/00" of Motions - corresponding to the concept of pure kinetic energy - can be designated 5'. Motions as concept becomes in this model the ultimate translation of the 5th dimension degree, expressions for the underlying unity, the "Entirety" stepwise transformed. In this model Motions are regarded not only as relative but also as absolute realities. Time is regarded as defined in the d-degree of motions, which also means that it is evolved in first and each following steps towards lower d-degrees. The d-degree of motions will increase when d-degree of structure decreases. Hence, motions form a "counterdirected" chain to the chain of structure. 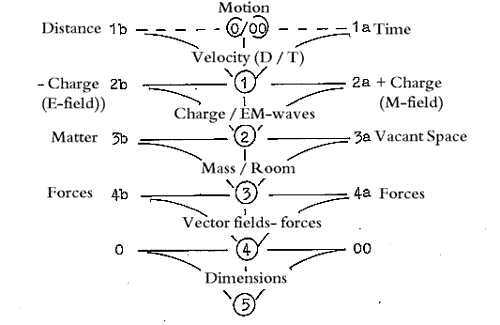 Chain of structures: 5 -- 4 --- 3 --- 2 --- 1 ---0/00 "
· Vibration in 1 dimension - in 4-dimensional vector fields? Compare, as an association, with the temperature (here) motions in one- and two-atomic gases Ew = 3/2, 5/2 or 7/2 (times a constant, times Temperature). Dimensional degree of analysis will be optional, when d-degree of motions are included. Different models of the atom for example would have the same validity, if external relations or motions are included: analyses in vector fields, or particle models or the shell models. We could add here: analysis in structures of 1-dimensional lines or "strings". The model implies that everything is interrelated - at bottom. And if so, the 5 primary dimensions should manifest themselves in all phenomenon we choose to study. This is the basis of the model as a skeleton in terms of concepts and geometries. In the first step 5→4, to centre and anticenter, there is only the concept of pure Density, directions from a centre illustrating a gradient of "near / far" from the centre. Implicitly it contains such relations as Mass per Volume, or in the other end of the dimension chain Frequency or Distance per Time (velocity). Here as Volumes, geometrically defined as characterized by enclosed / excluded centre, are here identified with Mass and Vacant Space, the opposition in the formula E = +/- mc2(Dirac); that is in the aspect on Mass or Matter as e.g. celestial bodies occupying space in a 3-dimensional room, that is when analysed as 3-dimensional. Steps (3) → 2 → 1 →0/00 will represent waves: with degree of motions increasing, the structure gets increasing motional character. Here is introduced the hypothesis that Charge as a 2-dimensional property in relation to Mass when interpreted as 3-dimensional. The suggestion should imply that it would be possible to find some difference of 1 dimension degree in the mathematical equations that are connected with electric charge, compared with equations related to masses - or matter. (About the difference mass - matter, see that file). Charges with opposite signs (+/-) may eventually be regarded as represented by the opposite halves of coordinate axes. The degree of lines may represent the elementary concept of Distance, but could also be identified with elementary potentials. Compare too the concept of "field lines". In addition we have path ways for particles or bodies like planets. One suggestion here is to identify the d-degree steps themselves with the concept Velocity and this polarized into Distance and Time in the sense of "scales", that is 1-dimensional physical entities. Distances transform into Time in one direction, Time into distances, change in relative positions, in the other direction. Motions as pure kinetic energy. Temperature will of course be one concept in this d-degree of Motions. The polarizations imply that 1 d-degree of the inner structure of a unit gets transformed to outer motion. That's at least one thing to say about them here. Compare how Einstein by using the complex number √-1 (for Time) moved Time to the same side of an equation as the 3 room coordinates and got a 4-dimensional Space. One example of a polarization in elementary physics is the disintegration of neutrons outside the atoms: n → p + e, by "weak interaction". Most things however which we recognize is already polarized realities and in that sense - it's relations we perceive. Unpolarized higher d-degrees seem as "superpositions " in the sense of Quantum mechanics. The development from higher to lower degrees in such a dimension chain is in this respect in agreement with the energy law of entropy - which still has its well-known opposite, as in the structuring of life. It differs probably in several aspects from the scientists' research in 5-dimensional mathematics, those inspired for example by Theodor Kaluza, but could eventually have connections with it as in the file about forces which is called "MEGA-fields", (magnetic, electric, gravitational and acceleration forces or vector fields). About counting with 5 dimensions, one should observe that the common elementary coordinate system for 3 dimensions presupposes, without mentioning it, a centre, an origin - and signs (+) and ((-) on the opposite directed halves of the coordinate axes: this means a couple of extra specifications in addition to the 3 about x-y-z coordinates. It's a common view that "abstractions" represent "high levels" of the human mind. Here concepts such as geometries are understood as the opposite, very deep realities - in the bottom of human mind and of the world. There is a process of gradual substantiation to the material world. Matter, versus "non-material" things should be a question of (relative) structure. The development toward our "material" and "anti-material" world from both higher and lower d-degrees is regarded as a question of increasing complexity and gradual substantiation. A general aspect on development in the model is the gradually building-in of the 00-pole, the anticenter as "surrounding" into units representing centres. So in development towards life . This implies growing complexity in the centre-units in relation to the surrounding as "anticenters". - The concept of "forces" has been discussed and sometimes dissolved into mathematical relations. Still the concept of "forces" seems to be indispensable, so in the concept of "carriers" of forces, distinguished from other elementary particles, and in the so-called 4 known forces in physics. It is of course central in the standard model of quantum mechanics. - When talking about "forces", emphasis is given to something opposite to "structure", Relations however has also the character of structure. This ambiguity fits very well in this dimension model. - Forces in the old definition is something that generates changes in direction or velocity of motions. In the model here such changes are primarily related to d-degree steps. - Here the opposition is introduced between binding and polarizing forces, and the simple starting point that the bond between two parts of a unit is the unit of which they are, or "were", parts. - According to that statement, the binding force in each dimension degree is assumed to be the next higher dimension degree. Then the 4th dimension degree constitutes the binding force in the 3rd dimension degree, the 3rd in the 2nd and so on. And a line, or distance, is the binding force in motions. (Apparently so in human beings' building of roads and railways as materialization of distances and then using different vehicles to "bind the endpoints together"!). - In the opposite direction we ought to have the polarizing forces, from lower to next higher dimension degree. - Then a "force" can be defined as one dimension degree operating upon next lower or higher degree, the latter seen or analysed as structure. - A dimension could superficially be resembled with a rubber band that is stretched. The binding force is the contracting, inner, chemical force in the rubber material itself. The polarizing, stretching force comes from the outside. - With these assumptions Structure and Force (or pair of forces) show up as two aspects on a dimension, depending on the starting point of the analysis. The concept of force is in a simple way traced the back to the concept of dimension. - It's worth remembering that the proton p (H+) and the electron (e-) are real "carrier of forces" in biochemical processes on a superposed level, in spite of being fermions and not having integer spin. The same view may be applied to all organisms on the biological level, acting as forces. And, on the ground level, pure motions are forces, as a fist hitting something. Such aspects support the interpretation of forces as a question about relations between dimensions. - At the same time it's possible to identify vector fields of 4th d-degree as representing primary forces in usual physical sense with forces often illustrated by vectors. Here the difference between bosons and fermions miss mass would be applicable including the difference in complexity of spin. transformed and expressed in all motions and dynamic processes in Universe. still, as part of d-degree 5 primarily also with the character of an "aggregating" force. "From outside". Relations between lower and higher d-degrees are also of the kind 00 to 0: manifolds versus unity, for instance an infinity of surfaces in a volume, of lines in a surface. Polarizing and binding forces in other words: Surroundings separate the force or Directions from the center, gets integrated by the center. (As in Biology). A similar relation could be found between concepts as continuum versus quantified realities or fields: the 00-pole as the quantifying one, continuum from the 0-pole the one that gets quantified. Since all "b-/and a-poles" of lower degrees inherit features from the 0-and 00-poles respectively, this would be a logical consequence. The concept of connection is ambiguous: The structural or outer connection between for instance poles 4b and 4a is in this model d-degree 3. While the deeper, perhaps expressible as "operational" relation goes through d-degree 4 as an inner, underlying connection, the common origin. A dimension chain 5 →4 →3 →2 →1 →0/00 can be understood as a dynamic process of polarizations, of dimension steps. We can also focus on the dimension degrees themselves as potentials instead of the steps and see the chain as a structure - like a standing wave can be seen as a structure. We choose then a static view. Static/dynamic or structure/process becomes two aspects on dimension chains. Such steps may imply enclosing of a center, defining a "separate" unit, leaving an open rest angle for the communication with the outer world, the "00-pole". a) A development toward higher levels - as a "level chain" through step 3-2; the primary dimension chain is viewed perpendicular, d-degree steps meeting in the middle, in step 3 → ↑8594;2. See illustration below (from file Forces). b) A development of new dimension chains as secondary"loops" in each step of the primary chain, possible to interpret as "fractals". It seems as if the two assumptions turn out to be different aspects on the same dimensional development of new "levels". Look at the superposed number chain 9-7-5-3-1. The quotient between the rest masses of proton and electron is given at 1836.12 (data from 1973).. The proton has most of the mass, d-degree 3, the electron form the atomic shell, d-degree 2. According to Gamow the proton and the electron have about the same energy if the kinetic energy of the electron is taken into account. (One assumption about numbers is that a d-degree step in some contexts could represent a 10-power step.). © Åsa Wohlin: Universe in 5 dimensions - as a model of Zero. A conceptual structure suggested for interpretations in different sciences. Free to distribute if the source is mentioned. Texts are mostly extractions from a booklet series, made publicly available in year 2000. Charge - what is it? Spin - how to interpret it? Gravity waves, Dark matter etc. A book "The I versus the Ego"